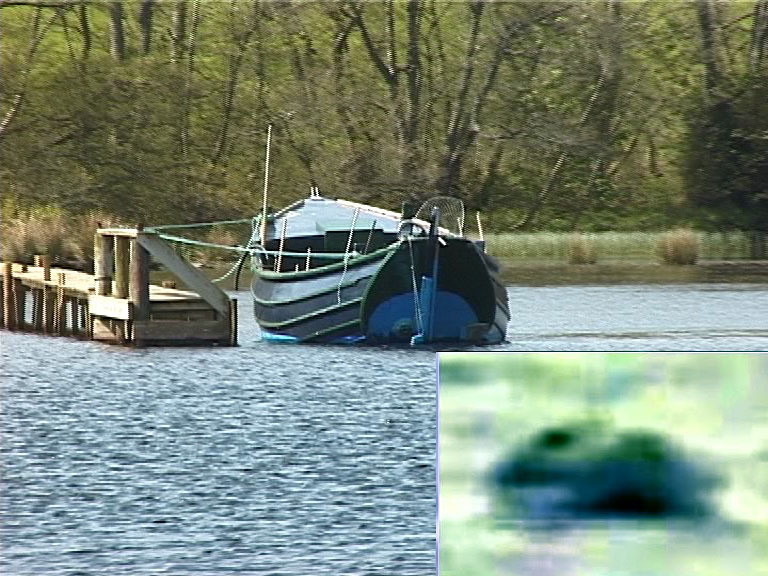 In 2002 John (Jackie) Gillies recorded an object on Loch Ness whilst standing in Urquhart Castle car park.The video is shot at full zoom and is hand-held, making it very shaky. Some people can see the head of a large animal in some of the frames, while my own view is that the video shows the Whitby coble "Mayflower" in quite choppy conditions. "Mayflower" was skippered by Bruce Wynne and took parties of anglers on trips on Loch Ness. At the time of writing (August 2009) the boat is not operating on Loch Ness and so comparative footage cannot be obtained. I show below a short, partially stabilised and slowed down extract from John's video and a photograph of the "Mayflower" at her jetty. In the video, which is shot from the North-east end of the Urquhart Castle car park, the boat is heading away and slightly to the left - similar to its position in the still photograph at the jetty. The camera position is however approximately 100 feet above the level of the loch. In my interpretation, the "upper jaw" seen by some is the gunwale and upper part of the boats hull and foredeck, the "open mouth" is the darker part of the boats side, and the "lower jaw" is a combination of lighter paint near the waterline and white foam as the boat causes the waves to break. The "eye" is part of the forward bulkhead. The boat is pitching and rolling quite a lot and the light is catching the various surfaces of the boat in a rapidly changing manner as it heads into and across the waves, which are coming from the North-East (left).